REEEEEMIXXX! 16 is one of the early hardstyle tracks where we used to rave on when we just started clubbing back in 2002. 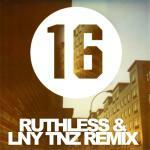 After a lot of great memories and goose bump moments we decided to give this track a little Ruthless & LNY TNZ flavour. Here is our very unofficial remix on Ard und Jorn's "16".